Envelopes can be used in synthesis to modulate literally anything in the signal path including the parameters of other modulators like LFOs. Yet many still consider their use simply in terms of amplitude modulation alone. Before getting into alternate uses, let’s look at the fundamental stages of an envelop and variations you may come across. An Envelope is simply a table of data points that is output over a specified period of time. The output is triggered by a user event, typically a new note or key press. There is usually some sort of sustain stage that will dictate the overall duration of the envelope based on how long a key is pressed. 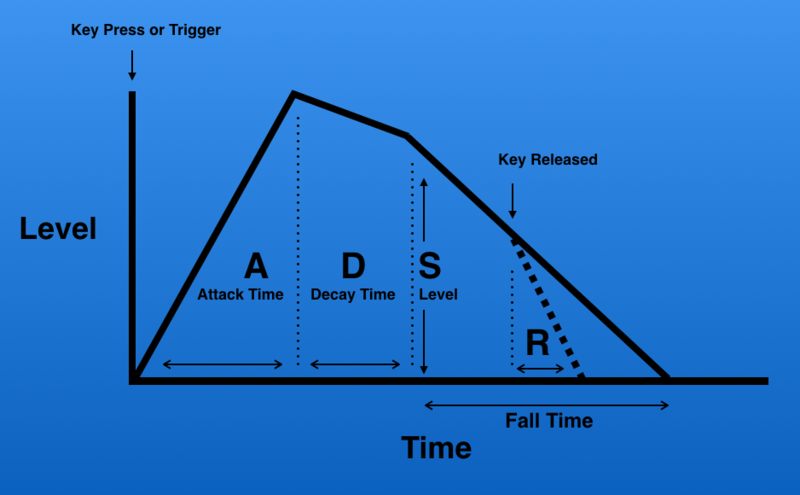 Attack: The amount of time it takes for the envelop to reach the end of that first stage, usually the peak level. Sustain: The level of output while a sustain instruction persists (held note). 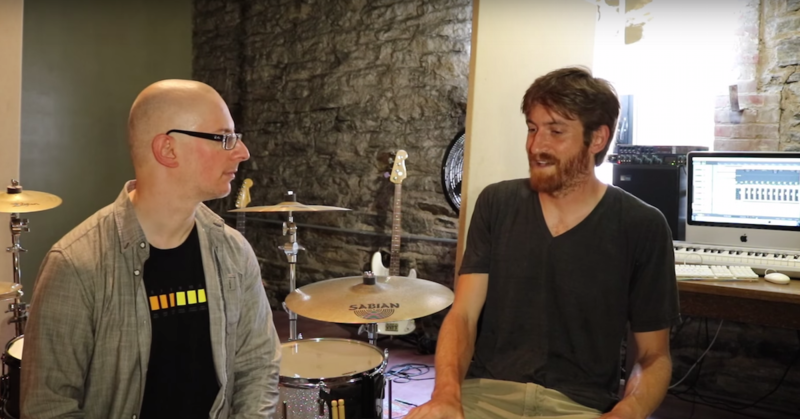 It is important to observe that the sustain parameter is a measure of level, not time. This stage can theoretically last indefinitely. 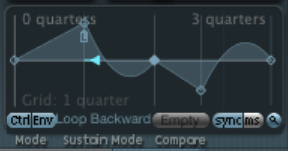 Release: The time it takes for the output to decrease to zero after the key is released or the sustain instruction ends. In the ES2 for example, Envelopes 2 and 3 have a ‘Sustain – Time control’. When a Rise time is set, the level will rise back up to maximum and stay there until the Release stage. 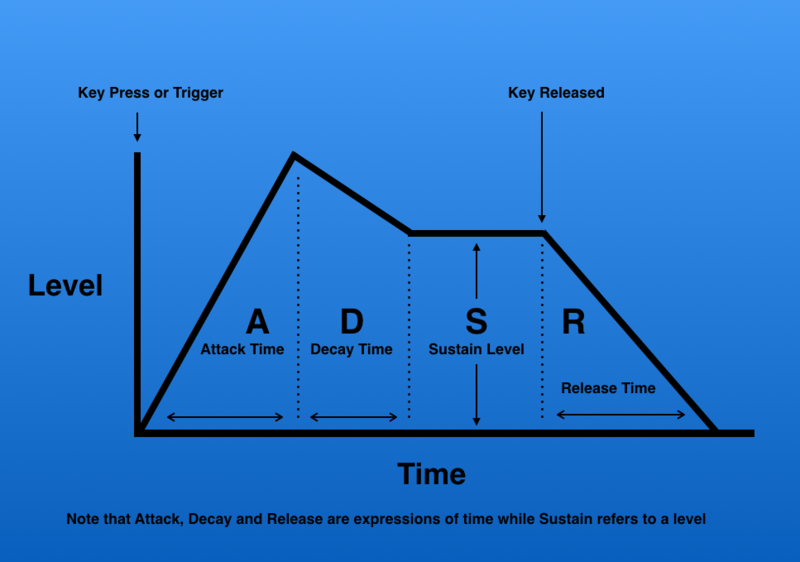 When a Fall time is set, the level will begin to decay after the Sustain level is reached and continue to zero. 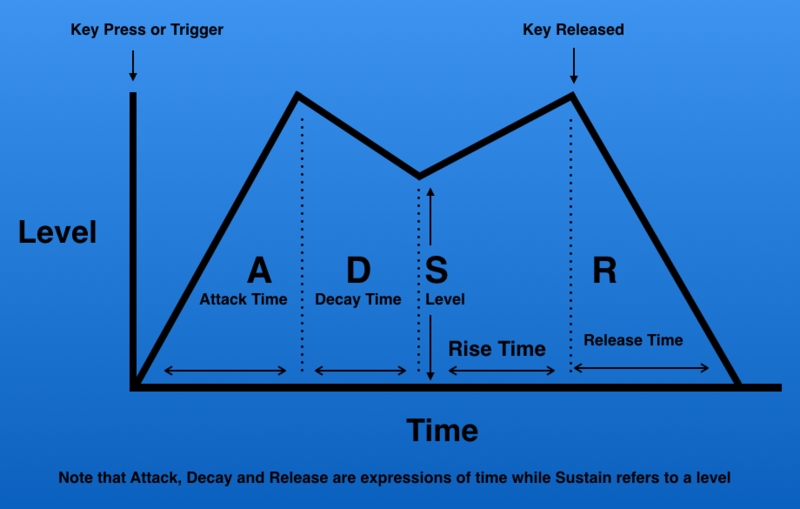 But the Release stage may still have an effect if the key is Released before the level has fully decayed and defend the relative time settings for Fall And Release. The dotted line above indicates that the Release stage was activated and superseded the Fall time which was already in progress. 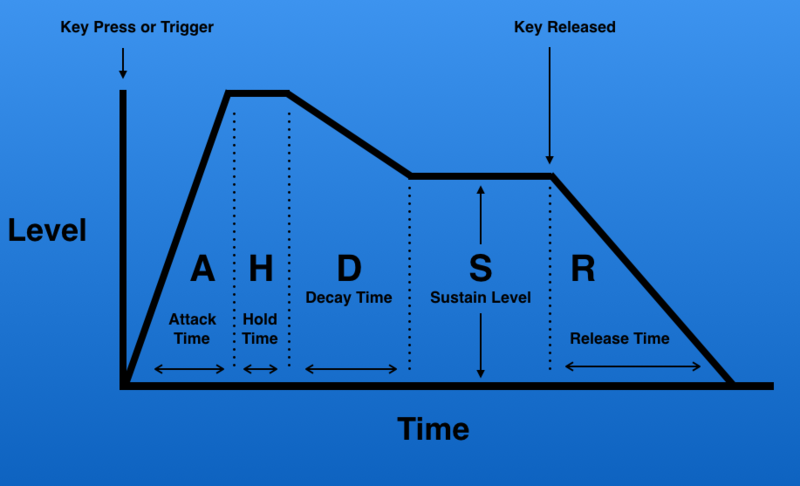 The H in this acronym stands for Hold time and allows you to adjust the time that the peak amplitude level is held before the decay stage of the envelope begins. First, it can function as either an AD (Attack/Decay) or AR (Attack/Release) two stage envelope depending on how it’s set. Poly mode — This is typical envelope behavior where each note or event triggers an independent envelope. Third, the split slider control on the Attack parameter allows the user to specify the influence of Velocity on the Attack phase. In contrast to simple two or four stage envelopes, multiple stage envelops can be found for complex modulation possibilities. The typical use of an envelope is to control or modulate amplitude. If there are multiple envelopes in an instrument, the last envelop is typically hardwired to amplitude (in the case of the ES2 that would be Envelop 3). This means that no additional routing needs to be set up in the instrument for amplitude to be controlled. 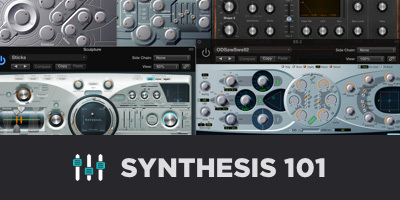 The difference between modulating a parameter with an LFO vs. an Envelope is that LFO’s are intended to continuously repeat at a certain rate or frequency, whereas envelopes are usually triggered events based on some user input like a key press. The envelope generates data based on the duration of the event. But as mentioned above in the example from Sculpture, some envelopes can also be looped, in which case they become a sort of an LFO in their own right, based on their particular shape. As with LFOs, the impact of an envelope on whatever parameter it is attached to can often be controlled. 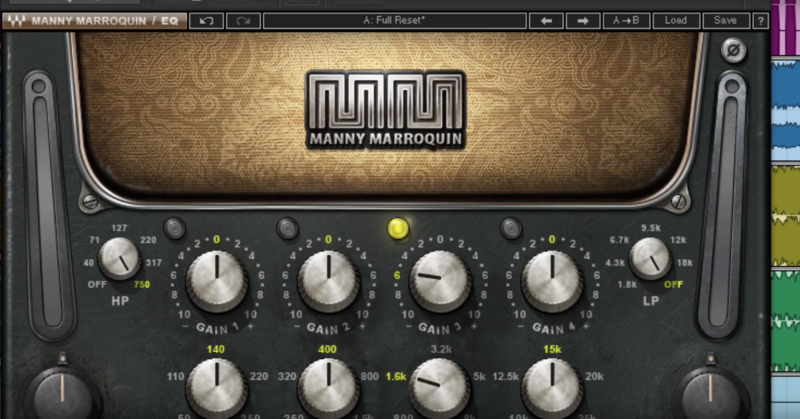 Logic Pro uses the via nomenclature to accommodate this parameter. 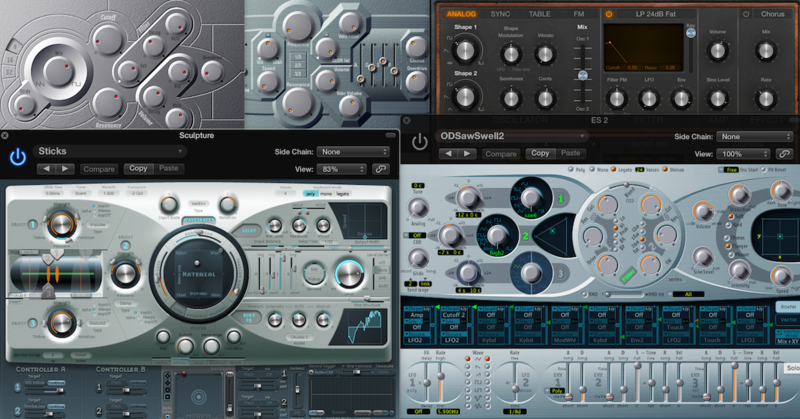 Envelopes can be influenced by velocity, aftertouch, the mod wheel, or theoretically any MIDI continuous controller. Envelopes are crucial to creating unique synthesized sounds and can be used to modulate a myriad of parameters beyond amplitude for timbral and textural variety. In the next article, I’ll look at X/Y Pads, some unusual Morphing functions, and multi-stage Vector envelops.